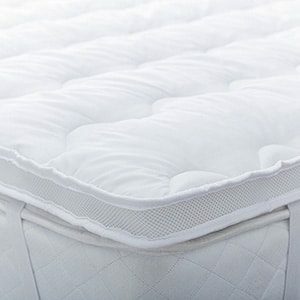 The Airmax mattress topper is actually really nice for the price. It’s definitely not as plump as it looks but it’ll spruce up a lumpy mattress just fine, and far cheaper than replacing the whole thing! It’s made to keep you cool with some nice big air-vents that run along the side of the whole thing. These increase airflow through the whole topper so when you lie on it the heat from your body goes into the topper and flows out the sides. When you lie on it the whole thing squishes down a lot so doesn’t offer much in the way of support but it definitely makes the bed comfier. And they have really long corner straps! A pet peeve of mine is mattress topper straps that won’t fit around your mattress to hold it in place. The filling is hollow fibre so it’ll likely feel similar to your pillow and the cover is microfibre which is always nice and soft. Yes you can! Go for an order of mattress topper, electric blanket, then sheet. Otherwise you don’t really get the benefits of the electric blanket. And if you need some help with an electric blanket then check out my guide here. Nice and easy beacuse it’s just single, double and king. It’s machine washable if you have a reasonably big machine to put it in. You’ll need a similar size to the size you’d need for a double winter duvet. And It’s got a 2-year manufacturer guarantee, so if anything goes wrong with it you can phone up their customer service and get a refund. 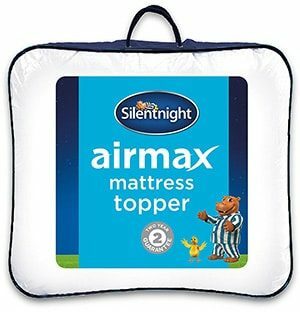 If you need a nice cooling, comfort boost on your bed but are on a tight budget then the Silentnight Airmax is the topper for you.